The 2013 Jetta Hybrid took me almost 160 miles on a quarter tank of gas or about 3 gallons which, projected out, is over 600 miles or better than 50 miles to the gallon on a single tank with a mix of street and highway driving. That's impressive, especially when the advertised combined mpg is 45. The Jetta hybrid braking may have been the only small difference but didn't take much getting used to. The Jetta hybrid is a greener alternative to the diesel version and also a way Volkswagen, with its lofty sales goals, can appeal to the hybrid crowd. On the diesel comparison, I had just started my week long test drive in the Jetta Hybrid when a father and son pulled up next to me their Passat TDI bragging about its 45 mpg and the fact it was manufactured in Chattanooga, Tennessee. Same manufacturer with another economical powerplant option so why argue. The trunk space was also more spacious than one would expect with two engines. 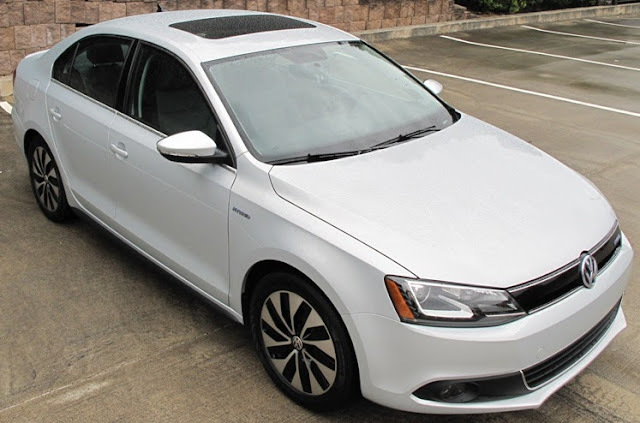 The 2013 Volkswagen Jetta Hybrid is powered by a peppy 1.4 liter turbocharged direct-injection TSI four-cylinder gasoline engine with a 27 horsepower eletric motor that produces and combined output of 170 horsepower. The 7 speed DSG dual-clutch automatic transmission was impressively smooth and can be operated as a pure automatic in “D” mode or shifted manually and there's an "S' sport mode as well. The “ePower meter” includes the level of battery charge and the available amount of electric driving. The Jetta Hybrid starts at $24,995 for entry-level model with Bluetooth connectivity, Climatronic dual-zone climate control, a leather-wrapped multifunction steering wheel, and a six-speaker audio system. 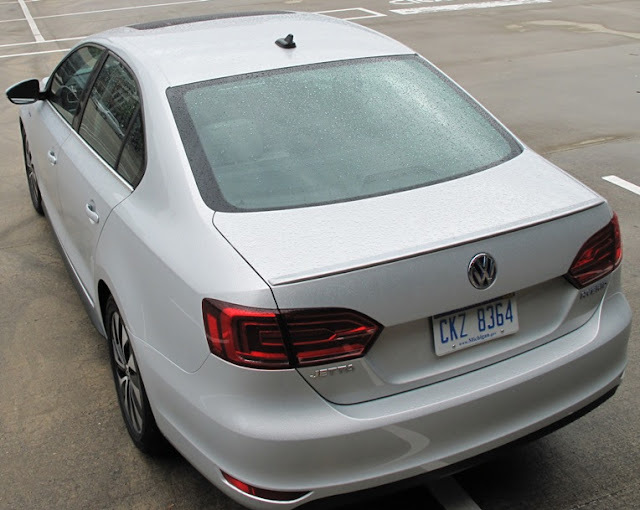 The Jetta Hybrid SE at $26,990 adds LED taillights, keyless access with push-button start, Premium VIII touchscreen audio system with color energy flow display in the center console and Media-Device Interface with iPod® cable and SiriusXM® Satellite Radio. The Jetta Hybrid SEL at 29,325 has all the SE trim and adds 16-inch aluminum-alloy wheels, a power tilt and slide sunroof, the RNS315 touchscreen navigation system and heated seats with power adjustment on the driver’s side. The Jetta Hybrid SEL Premium at $31,180 adds Bi-Xenon headlamps with LED DRLs and the Active Front-Lighting System, foglights with cornering lights, 17-inch aluminum-alloy wheels, a rearview camera, and the Fender Premium Audio System. The driving experience is very similar to a conventional Jetta but the “E-Mode” which keeps the Jetta in electric mode until the battery is depleted certainly helped me achieve the impressive 50+ mpg. Bottom Line: Jetta is the most popular VW model based on sales (39 percent of VW first half 2013 U.S. sales) so a hybrid version for exceptional fuel economy is a win-win for hybrid buyers seeking a conventional ride with environmental benefits. Volkswagen provided the vehicle for evaluation purposes. The all-new high-performance 2014 Audi RS 7 five-door coupe powered by a 560 horsepower twin-turbo 4.0 TFSI V8 engine mated to an eight-speed Tiptronic® automatic transmission will start at $104,900 when it arrives in U.S. showrooms this Fall. The Audi RS 7 has a 0-60 mph time of 3.7 seconds and a top track speed of 174 mph and features the Audi quattro® all-wheel drive system with sport differential. The RS 7 is equipped standard with Audi side assist, which monitors the blind spot areas, as well as fast-approaching vehicles, at a range of approximately 150 ft. to the rear of the car. The optional Night Vision Assistant can detect pedestrians approximately 300 ft. ahead of the vehicle. A cornerview camera is part of the Driver Assistance plus package, and the available adaptive cruise control and Audi pre sense plus enhances safety for drivers and their passengers. The RS 7 has cylinder on demand technology that deactivates cylinders 2, 3, 5 and 8 by closing their valves via electromechanical actuators. The 4.0 TFSI runs in four-cylinder mode, providing up to 15 percent better fuel efficiency, while the active engine mounts remove any changes in vibration between eight and four-cylinder modes. With the RS 7, the expanding A7 model line now has the A7 TDI® clean diesel along with the A7 3.0T and S7 4.0T variants. The BMW i3 is the first product of the new BMW i sub-brand, made of carbon fiber reinforced plastic, weighing about 2,700 lbs and able to recharge in only 3 hours with the use of a 220V Level 2, 32-amp J1772 charger. With the optional SAE DC Combo Fast Charging, the BMW i3 can be juiced up to 80% in 20 minutes, and 100% in 30. The 170-hp, 184 lb-ft hybrid-synchronous electric motor weighs only 110 lbs. and propels the i3 from 0-30mph in 3.5 seconds, 0-60mph in approximately 7.2 seconds, and to an electronically limited top speed of 93 mph. Also available for extended range is a rear-mounted 650cc, 34 horsepower, two-cylinder, gasoline-powered Range Extender generator which adds roughly 330 lbs. to the vehicle curb weight with a fuel capacity of 2.4 gallons and never directly drives the vehicle’s wheels but does roughly double the vehicle’s range of 80-100 miles. When the battery gets to a certain level, the Range Extender starts and maintains the battery’s current state of charge. The 22-kWh lithium-ion battery weighs 450 lbs. Pricing (before federal or local incentives) starts at $41,350 and $45,200 for Range Extender model. (Excluding Destination & Handling Fee which is currently $925). 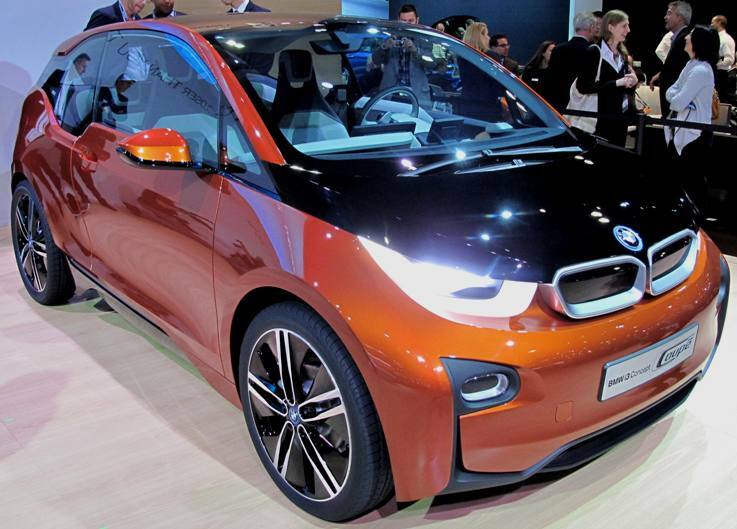 The BMW i3 goes on sale in the U.S. in the 2nd quarter of 2014. The all-new 2014 Mazda3, the brand's best-selling vehicle, starts at $17,740 (including $795 destination charge) for the sedan i SV with the SKYACTIV-G 155 horsepower 2.0-liter mated to a SKYACTIV-MT six-speed manual transmission delivering 33 mpg combined city/highway. The 2014 model is $245 more than the outgoing 2013 model. The sedan i SV with the SKYACTIV-Drive six-speed automatic starts at $18,790. The redesigned compact vehicle will also offer a SKYACTIV-G 184 horsepower 2.5-liter gasoline engine. The Mazda3 i Touring four-door with SKYACTIV-MT starts at $20,390 MSRP while the five-door version adds $500 to a starting price of $20,890 MSRP. Like i Sport models, the automatic transmission can be added for $1,050, regardless of how many doors are optioned. A Touring Technology Package ($1,600 MSRP) is available for all i Touring models. The i Grand Touring starts at $23,540 MSRP for the sedan and $24.040 MSRP for the five-door when featuring a SKYACTIV-MT six-speed manual transmission. The SKYACTIV-Drive six-speed automatic adds $1,050 to $24,590 MSRP and $25,090 MSRP, respectively. The Mazda3 s Touring sedan starts at $25,390 MSRP, the five-door model starts at $25,890 MSRP, the top-of-the-line s Grand Touring sedan starts at $26,790 MSRP and the five-door at $27,290 MSRP. Fuel economy for all five-door models featuring the SKYACTIV-G 2.0-liter engine has an EPA rating of 29 city/40 highway/33 combined mpg with a manual transmission and 30 city/40 highway/33 combined mpg when equipped with an automatic. Sedan models are estimated to offer 29 city/41 highway mpg (6MT) and 30 city/41 highway mpg (6AT). J.D. Power's 2013 Automotive Performance, Execution and Layout (APEAL) Study, redesigned for this, its 18th year, to measure new-vehicle appeal is based on responses gathered between February and May 2013 from more than 83,000 purchasers and lessees of new 2013 model year cars and light trucks, who were surveyed after the first 90 days of ownership. Porsche is the highest-ranked nameplate for a ninth consecutive year. Ram is the highest-ranked non-premium nameplate. The Land Rover Range Rover achieves the highest APEAL score of any single model in the study in 2013, the first time for a model outside the large premium car segment. Volkswagen Group receives the highest number of segment awards of all manufacturers included in the APEAL Study, earning recognition for the Audi Allroad, Porsche Boxster, Porsche Cayenne, Volkswagen GTI, and Volkswagen Passat. Chevrolet receives the highest number of segment awards of any brand in the study, for the Avalanche, Sonic and Volt models. Ford and Nissan brands each receive two model awards: Ford, for the F-250/F-350 Super Duty and for the Mustang; Nissan, for the Armada and the Murano. Also receiving awards are the BMW 5 Series; Buick Encore; Dodge Charger; Fiat 500; Honda Odyssey; Kia Soul; Land Rover Range Rover; Lexus LS; Lincoln MKZ; Mazda CX-5; and Mercedes-Benz SL-Class. The BMW i3 electric vehicle will debut in New York, London and Beijing next Monday with an MSRP of $42,275 (including Destination & Handling fee and excluding Federal incentives). The BMW i3 with a 170 horsepower and 184 lb-ft of torque hybrid-synchronous electric motor is expected to have an emission-free driving range of 80-100 miles. 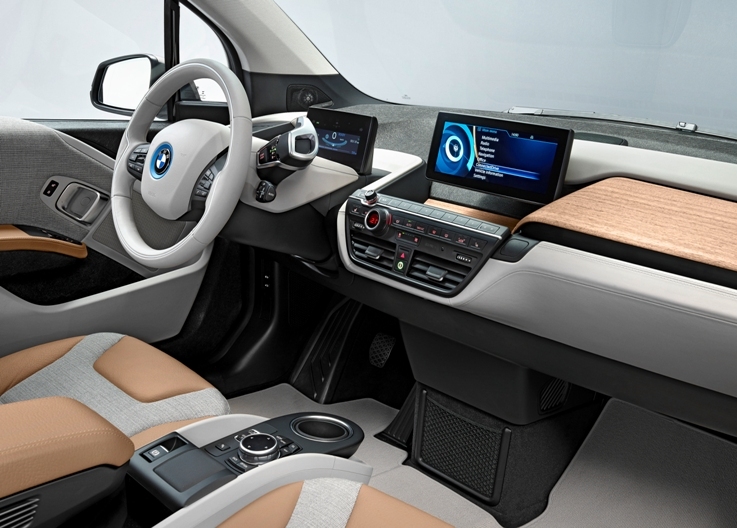 There's a home charging station supplied by BMW i or the i3 can be charged at any public charging station that uses a Level 2 SAE J1772 charging system. DC fast charging, using the SAE DC Combo-Fast Charger, will be available as an option. From a public fast-charging station, it will provide an 80 percent charge from a fully depleted battery in just 20 minutes. It will arrive in US showrooms in the second quarter of 2014. The 2014 Ford F-150 Tremor is a short-wheelbase, regular-cab pickup truck powered by a 365 horsepower 3.5-liter EcoBoost engine, the first-ever EcoBoost®-powered sport truck. Ford's EcoBoost® engines are turbocharged, direct injected gas engines designed to deliver power and torque similar to larger engines in an attempt to compete with hybrid and diesel engines by achieving about 20 percent better fuel efficiency and 15 percent lower polluting emissions than the larger powerplants. Overall F-Series truck sales are 367,486 for the first six months of 2013, a 22 percent increase over the first half of 2012 after the best June sales month for F-Series since 2005. General Motors sold 264,843 vehicles in the United States in June, up 6.5 percent compared with a year ago. Deliveries to retail customers increased 14 percent while fleet sales declined 9 percent due to the timing of customer deliveries. Year-to-date sales of 1,420,346 is an 8 percent gain over 2012. Ford Motor Company's U.S. June sales were 235,643, up 13.4 percent compared with a year ago, marking Ford's best June sales results since 2006. Cars are up 12 percent, utilities are up 8 percent, and trucks are up 20 percent. Year-to-date sales are 1,293,295 a gain of 13.1 percent over the first half of 2012. Toyota Motor Sales , U.S.A., reported June 2013 sales results of 195,235, an increase of 9.8 percent from the year-ago month. For the first half of the year, TMS reported sales of 1,108,791, up 6 percent year-over-year. Chrysler reported U.S. sales of 156,686, an 8 percent increase compared with sales in June 2012 and the best June sales since 2007. Year-to-date Chrysler sales are 908,332, up 9 percent over 2013. American Honda reported June 2013 U.S. sales of 136,915, up 9.7 percent compared with June 2012. The Honda division posted June 2013 sales of 123,150, an increase of 12.5 percent compared with June 2012. Acura division U.S. June sales of 13,765 down 10.4 percent compared with June 2012. Nissan U.S. sales in June totaled 104,124, an increase of 12.9 percent over a year earlier for Nissan's best-ever June U.S. sales performance. Year-to-date sales are 624,709, an 8.1 percent increase over last year. Nissan Division sales increased 16.1 percent to 95,010, also a June record. Sales of Infiniti vehicles in June totaled 9,114, a 12.7 percent drop from 2012. Hyundai Motor America announced sales of 65,007, up 1.9 percent versus the same period in 2012 and year-to-date 361,010 up 1.2 percent the first six months of the year. Kia Motors America reported June sales of 50,536, a 1.5 percent drop from last year. Year-to-date sales are 277,351, a 3.9 percent decline compared to the first half of 2012. Subaru of America reported 39,235 vehicle sales for the month of June, a 42 percent increase over June 2012. Year-to-date sales for Subaru total 204,597, 25 percent higher than the same period in 2012. Volkswagen of America reported sales of 36,957, a 3.2 percent decrease over prior year sales. Year-to-date 2013 sales of 206,792 is a 0.9 percent decline from 2012. Separately, Audi reported June 2013 sales of 13,706 vehicles, an 8.2 percent increase over the previous June record set last year. Year-to-date Audi 2013 sales of 74,277 is a 14 percent increase over 2012. The BMW Group in the U.S. (BMW and MINI combined) reported June sales of 33,645 vehicles, an increase of 21.4 percent from the same month a year ago. Year-to-date, the BMW Group (BMW and MINI combined) is up 9.0 percent on sales of 172,787 in the first six months of 2013 compared to the same period in 2012. Mercedes-Benz USA reported combined sales of 27,162 for June, a 7.0 percent increase over the same month last year. Sales totals at Mercedes-Benz rose 9.8 percent to 24,415, bringing year-to-date sales to 141,950, up 9.4 percent over 2012. Sprinter Vans posted strong year-to-date sales of 9,483, which combined with year-to-date sales of 4,459 from smart to bring MBUSA's first-half total to 155,892. This marks the best second-quarter finish in the company's history and the sixth consecutive month of best-ever sales for 2013. Mazda North American Operations reported June U.S. sales of 22,496 vehicles, an increase of 13.0 percent versus last year and the best June since 2007. Year-to-date sales through June are up 0.8 percent versus last year, with 144,943 vehicles sold. Porsche Cars North America announced June 2013 sales of 3,700 vehicles, marking the best June in company history. During the first half of 2013, PCNA has delivered 21,309 vehicles in the U.S., for an increase of 30 percent over last year which was a record-setting year.